Have you ever had one of those days that went way too fast? Today was one of those days for me. It started early and is ending late and time somehow got lost in-between. For our weekly book club, the designated person who chooses the book also chooses a little project for us. Each book lasts about 6 weeks. This go-around the project was about sunlight, to be mindful of the sun and capture it in a photo. A tiny, beautiful, little exercise to make us all enjoy those brilliant moments that can get lost beneath the blankets of winter. My mom sent this picture of her Sun Jar to me the other day. 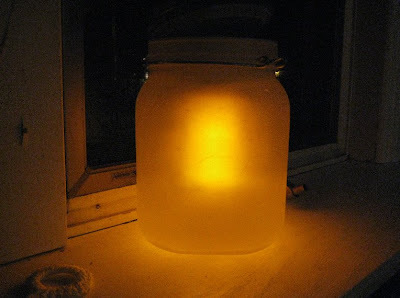 It's so peaceful; all that energy of a noisy, hectic day captured in a jar to illuminate the quiet lull of night. I hope to post some more pictures of sunlight in the upcoming days.